Enlighten. When you upgrade your space with recycled Brazilian Cherry flooring from Staybull Flooring® the aesthetic value of your space will be versatile, appealing, and elegant. Enrich. The Staybull® line of Brazilian Cherry flooring improves on an already celebrated design element. Greater durability and even more color variations make every prefinished Brazilian Cherry wide-plank board stand out. Engage. Reveal your home’s décor like never before. 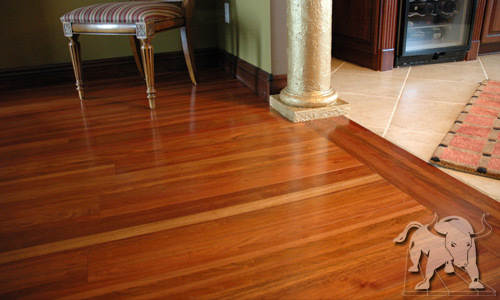 Brazilian Cherry hardwood flooring from Staybull® is an exceptional choice for any interior. Enhance your space. Contact us for a free quote of eco-friendly Brazilian Cherry Staybull Flooring®. Brazilian Cherry is salmon red to orange-brown marked with dark brown streaks. It has a golden luster. Grain is interlocked with a medium to coarse texture.